For other uses, see Magician (disambiguation) and Magi (disambiguation). A magician also known as a mage, warlock, witch, wizard, enchanter/enchantress, or sorcerer/sorceress, is someone who uses or practices magic derived from supernatural, occult, or arcane sources. :54 Magicians are common figures in works of fantasy, such as fantasy literature and role-playing games, and enjoy a rich history in mythology, legends, fiction, and folklore. Wizards can be cast similarly to the absent-minded professor: being foolish and prone to misconjuring. They can also be capable of great magic, both good or evil. :140–141 Even comical wizards are often capable of great feats, such as those of Miracle Max in The Princess Bride; although he is a washed-up wizard fired by the villain, he saves the dying hero. Wizards are often depicted as old, white-haired, and with long white beards majestic enough to occasionally host lurking woodland creatures. This depiction predates the modern fantasy genre, being derived from the traditional image of wizards such as Merlin. Terry Pratchett described robes as a magician's way of establishing to those they meet that they are capable of practicing magic. Magic can also require various sacrifices or the use of certain materials, such as gemstones, blood, or a live sacrifice. Even if the magician lacks scruples, obtaining the material may be difficult. A. K. Moonfire combines these limits in his book The Aubrey Stalking Portal. The magician expends power to fuel his spells, but does not replenish that power naturally; therefore, he must make sacrifices to generate more magical power. The extent of a wizard's knowledge is limited to which spells a wizard knows and can cast. Magic may also be limited by its danger; if a powerful spell can cause grave harm if miscast, wizards are likely to be wary of using it. :142 Other forms of magic are limited by consequences that, while not inherently dangerous, are at least undesirable. In A Wizard of Earthsea, every act of magic distorts the equilibrium of the world, which in turn has far-reaching consequences that can affect the entire world and everything in it. As a result, competent wizards do not use their magic frivolously. In Terry Pratchett's Discworld series, the Law of Conservation of Reality is a principle imposed by forces wanting wizards to not destroy the world, and works to limit how much power it is humanly possible to wield. Whatever your means, the effort put into reaching the ends stays the same. For example, when the wizards of Unseen University are chasing the hapless wizard Rincewind in the forest of Skund, the wizards send out search teams to go and find him on foot. The archchancellor beats them to it by using a powerful spell from his own office, and while he gets there first by clever use of his spell, he has used no less effort than the others. In the Enchanted Forest Chronicles, Patricia Wrede depicts wizards who use magic based on their staves and magicians who practice several kinds of magic, including wizard magic;[clarification needed] in the Regency fantasies, she and Caroline Stevermer depict magicians as identical to wizards, though inferior in skill and training. Steve Pemberton's The Times & Life of Lucifer Jones describes the distinction thus: "The difference between a wizard and a sorcerer is comparable to that between, say, a lion and a tiger, but wizards are acutely status-conscious, and to them, it's more like the difference between a lion and a dead kitten." In David Eddings's The Belgariad and The Malloreon series, several protagonists refer to their abilities powered by sheer will as "sorcery" and look down on the term "magician", which specifically refers to summoners of demonic agents. In role-playing games, the types of magic-users are more delineated and are named so that the players and game masters can know which rules apply. :385 Gary Gygax and Dave Arneson introduced the term "magic-user" in the original Dungeons & Dragons as a generic term for a practitioner of magic (in order to avoid the connotations of terms such as wizard or warlock); this lasted until the second edition of Advanced Dungeons & Dragons, where it was replaced with mage (later to become wizard). The exact rules vary from game to game. The wizard or mage, as a character class, is distinguished by the ability to cast certain kinds of magic but being weak in combat; subclasses are distinguished by strengths in some areas of magic and weakness in others. Sorcerers are distinguished from wizards as having an innate gift with magic, as well as having mystical or magical ancestry. Warlocks are distinguished from wizards as creating forbidden "pacts" with powerful creatures to harness their innate magical gifts. Enchanters often practice a type of magic that produces no physical effects on objects or people, but rather deceives the observer or target through the use of illusions. Enchantresses in particular practice this form of magic, often to seduce. :318 For instance, the Lady of the Green Kirtle in C.S. Lewis's The Silver Chair enchants Rilian into forgetting his father and Narnia; when that enchantment is broken, she attempts further enchantments with a sweet-smelling smoke and a thrumming musical instrument to baffle him and his rescuers into forgetting them again. Witch also carries evil connotations. L. Frank Baum named Glinda the "Good Witch of the South" in The Wonderful Wizard of Oz. In The Marvelous Land of Oz, he dubbed her "Glinda the Good," and from that point forward and in subsequent books, Baum referred to her as a sorceress rather than a witch to avoid the term that was more regarded as evil. A common motif in fiction is that the ability to use magic is innate and often rare, or gained through a large amount of study and practice. :616 In J. R. R. Tolkien's Middle-earth, it is mostly limited to non-humans, though some people gain small amounts and become known as sorcerers (wizards being powerful spirits). In many writers' works, it is reserved for a select group of humans, such as in J. K. Rowling's Harry Potter books, Katherine Kurtz's Deryni novels, or Randall Garrett's Lord Darcy universe. Magicians normally learn spells by reading ancient tomes called grimoires, which may have magical properties of their own. :126 Sorcerers in Conan the Barbarian often gained powers from such books, which are demarcated by their strange bindings. In worlds where magic is not an innate trait, the scarcity of these strange books may be a facet of the story; in Poul Anderson's A Midsummer Tempest, Prince Rupert seeks out the books of the magician Prospero to learn magic. The same occurs in the Dungeons and Dragons-based novel series Dragonlance Chronicles, wherein Raistlin Majere seeks out the books of the sorcerer Fistandantilus. Some magicians, even after training, continue their education by learning more spells, inventing new ones (and new magical objects), or rediscovering ancient spells, beings, or objects. For example, Dr. Strange from the Marvel Universe continues to learn about magic even after being named Sorcerer Supreme. He often encounters creatures that haven't been seen for centuries or more. In the same universe, Dr. Doom continues to pursue magical knowledge after mastering it by combining magic with science. Fred and George Weasley from Harry Potter invent new magical items and sell them as legitimate defense items. 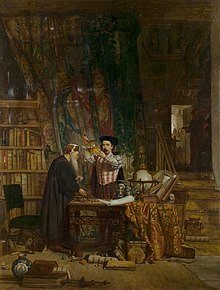 Historically, many self-proclaimed magicians have required rare and precious materials, such as crystal balls, rare herbs (often picked by prescribed rituals), and chemicals such as mercury. This is less common in fantasy. Many magicians require no materials at all;:617 those that do may require only simple and easily obtained materials. Role-playing games are more likely to require such materials for at least some spells to prevent characters from casting them too easily. Wands and staves have long been used as requirements for the magician. :152 The first magical wand was featured in the Odyssey, used by Circe to transform Odysseus's men into animals. Italian fairy tales put wands into the hands of powerful fairies by the late Middle Ages. Today, magical wands are widespread and are used from Witch World to Harry Potter. In The Lord of the Rings, Gandalf refuses to surrender his own staff, breaking Saruman's, which strips the latter of his power. This dependency on a particular magical item is common, and necessary to limit the magician's power for the story's sake – without it, the magician's powers may be weakened or absent entirely. In the Harry Potter universe, a wizard must expend much greater effort and concentration to use magic without a wand, and only a few can control magic without one; taking away a wizard's wand in battle essentially disarms him. Nevertheless, many magicians live in pseudo-medieval settings in which their magic is not put to practical use in society; they may serve as mentors, act as quest companions, or even go on a quest themselves,:1027 but their magic does not build roads or buildings, provide immunizations, construct indoor plumbing, or do any of the other functions served by machinery; their worlds remain at a medieval level of technology. In other works, developing magic is difficult. In Rick Cook's Wizardry series, the extreme danger presented by magic and the difficulty of analyzing the magic have stymied magic and left humanity at the mercy of the dangerous elves until a wizard summons a computer programmer from a parallel world — ours — to apply the skills he learned in our world to magic. At other times, magic and technology do develop in tandem; this is most common in the alternate history genre. Patricia Wrede's Regency fantasies include a Royal Society of Wizards and a technological level equivalent to the actual Regency; Randall Garrett's Lord Darcy series, Robert A. Heinlein's Magic, Incorporated, and Poul Anderson's Operation Chaos all depict modern societies with magic equivalent to twentieth-century technology. In Harry Potter, wizards have magical equivalents to non-magical inventions; sometimes they duplicate them, as with the Hogwarts Express train. In the magic-noir world of the Dresden Files, wizards generally keep a low profile, though there is no explicit prohibition against interacting openly with non-magical humanity. The protagonist of the series, Harry Dresden, openly advertises in the Yellow Pages under the heading "Wizard" and maintains a business office, though other wizards tend to resent him for practicing his craft openly. Dresden primarily uses his magic to make a living finding lost items and people, performing exorcisms, and providing protection against the supernatural. 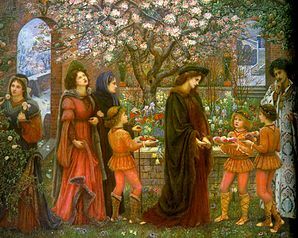 ^ "The Enchanted Garden of Messer Ansaldo by Marie Spartali Stillman". ArtMagick. Archived from the original on 2016-03-08. Retrieved 2013-10-16. ^ a b c d e Martin, Philip (2002). The Writer's Guide to Fantasy Literature: From Dragon's Lair to Hero's Quest: How to Write Fantasy Stories of Lasting Value (1st ed.). Waukesha, Wisconsin: Writer Books. ISBN 0871161958. ^ a b c Frye, Northrop (1971). Anatomy of Criticism; Four Essays (2nd ed.). Princeton: Princeton University Press. ISBN 0691012989. ^ a b c d e f g h i j k l m n o p q r Clute, John; Westfahl (1999). The Encyclopedia of Fantasy (1st ed.). New York: St. Martin's Griffin. ISBN 0312198698. ^ a b Driver, Martha W. (2004). The Medieval Hero on Screen: Representations from Beowulf to Buffy. Jefferson, North Carolina: McFarland. pp. 167–191. ISBN 0786419261. ^ Wood, Susan (1982). The Language of the Night: Essays On Fantasy and Science Fiction (Reprinted ed.). New York: Berkley Books. p. 41. ISBN 0425052052. ^ Fike, Justin. "The Role of Wizards in Fantasy Literature". The Victorian Web. Archived from the original on 2013-10-16. Retrieved 2013-10-16. ^ Card, Orson Scott (1999). Characters and Viewpoint (1st ed.). Cincinnati, Ohio: Writer's Digest Books. p. 100. ISBN 0898799279. ^ Colbert, David (2001). The Magical Worlds of Harry Potter: A Treasury of Myths, Legends, and Fascinating Facts (1st ed.). Wrightsville Beach, North Carolina: Lumina Press. p. 70. ISBN 0970844204. ^ Hickman, Tracy; Weis, Margaret (1987). DragonLance Adventures. Lake Geneva, Wisconsin: TSR. ISBN 0880384522. ^ Marcio, Kneidinger (1948-04-28). "Analysis". Terry Pratchett's Discworld. L-Space Web. Archived from the original on 2013-06-07. Retrieved 2013-10-16. ^ a b c Kern, Michael. "The Limits of Magic". The Victorian Web. Archived from the original on 2013-10-16. Retrieved 2013-10-13. ^ Cook, David "Zed" (1989). Advanced Dungeons & Dragons Player's Handbook (2nd ed.). Lake Geneva, Wisconsin: TSR. pp. 30–31. ISBN 0880387165. ^ Williams, Skip (2003). Dungeons & Dragons Player's Handbook (Special ed.). Renton, Washington: Wizards of the Coast. p. 51. ISBN 0786928867. ^ Bassham, Gregory (2005). The Chronicles of Narnia and Philosophy: the Lion, the Witch, and the Worldview (1st ed.). Chicago: Open Court. p. 171. ISBN 0812695887. ^ Riley, Michael O. (1997). Oz and Beyond: The Fantasy World of L. Frank Baum. Lawrence, Kansas: University Press of Kansas. p. 104. ISBN 070060832X. ^ Woolsey, Doug; Olson, Donald (2004). Battleaxe Rpg: Reforged Edition. Lulu.com. pp. 167–173. ISBN 9781442105935. Retrieved 19 February 2016. ^ Benvenuto, Raffaella (2006). "Italian Faries: Fate, Folletti, and Other Creatures of Legend". Journal of Mythic Arts. Endicott Studio. Archived from the original on 2013-10-16. Retrieved 2013-10-16. ^ "Comic Relief live chat transcript, March 2001". Accio Quote!. Retrieved 2013-10-16. ^ Brin, David (1994). Otherness. New York: Bantam Books. p. 261. ISBN 0553295284. ^ Krug, Kurt Anthony (2018-07-27). "There's Something About Harry: A Look Into Jim Butcher's Character Harry Dresden". The Strand Magazine. Retrieved 2019-01-18. Wikimedia Commons has media related to Fictional magicians.